When it was finally proven that Donald Wuerl is an out-and-out liar — like most people with a functioning brain already knew — The Washington Post responded to the disgraced cardinal's claim that he just "forgot" that he knew McCarrick was a homosexual predator with this blaring headline: "Why Don't Catholic Leaders Who Screw Up Just Say They're Sorry?" Indeed, why don't they? The author of the piece incorrectly concludes that the older generation of clergy is so used to being on a pedestal from their earlier years that they somehow don't know how to admit wrongdoing or apologize. That's a little naive — actually a lot naive. This has nothing to do with the fact that men Wuerl's age who became priests grew up in an "Oh yes, Father; anything you say, Father" Church. They did, that's true. But the real reason they don't apologize because of what they would be apologizing for. Consider for a moment if Wuerl was actually truthful, for once, what the import would be. He would say he was sorry for what? For covering up a homosexual predator and all the resultant harm that predator inflicted on the Church and individuals? And of course, if Wuerl were to ever come publicly clean about that — which he better do before he dies — then the next logical question he would have to answer is: why? Why, Your Eminence, did you keep quiet and let McCarrick rampage around the Church, destroying souls and bodies? And in the immortal bone-headed words of another lying homosexualist prelate, he just doesn't want to go down that rabbit hole. Why not? Because all the evil these malevolent men have inflicted on the Church for decades would be exposed by their own testimony. So in their calculus, they need to keep lying and being deceptive and distorting the truth because the truth of their actions is that they have been enemies of the Faith — and that dirty little secret must be protected at all costs. Various of these prelates throughout the decades have been actively engaged in remaking the Church, refashioning it into a just earthly organization. Any tip of the hat to the truth now, at this late moment of their lives as they prepare to face the God they don't seem to really believe in, would be to undo their entire lives' work, everything they have sought to do and, to a large degree, actually have done. 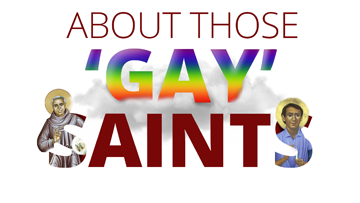 They have malformed decades of seminarians, overseen a flood of homosexual men into the priesthood and episcopate, shepherded countless souls out of the Church, aided and abetted sacrilegious Holy Communions by the tens, if not hundreds, of millions — not to mention in many cases enriched their own personal bank accounts, accommodated themselves to a life of luxury and forsaken their promises of chastity. There is only one reason these men will not simply say they are sorry, because it would reveal them as offspring of the serpent.